A CARDROSS soldier who later moved to Helensburgh had an astonishing military career before, during and after the First World War. 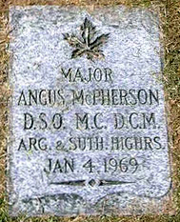 Angus McPherson, who was born in the village on December 10 1890, went on to win the Distinguished Conduct Medal, the Military Cross, and the Distinguished Service Order before leaving the Army on January 27 1921. The second son of gardener Dugald McPherson and his wife Jessie Wingate, and a member of large family who lived at Monaruadh, he joined the Scots Guards in 1907 at the age of 16. He landed in France on August 3 1914 and was involved with the many notorious World War One scenes of carnage at Mons, the Marne, Aigne, Ypres, La Bassee, Armentieres, Loos, Vimy Bridge, St Quentin, and Passchandall, during which he was wounded on three occasions. On February 4 1915 the then Acting Sergeant McPherson was commissioned as 2nd Lieutenant in Princess Louise's Argyll and Sutherland Highlanders. In what was to be an amazing year for him, he was awarded the DCM and it was published in the London Gazette on April 1. Back home on leave, on August 17 the 24 year-old officer married estate worker’s daughter Isabella Carruthers, who was 25, of 23 Queens Gate, Glasgow. The ceremony took place at 4 Minerva Street, Glasgow, by declaration, with his gardener brother Neil and dressmaker Jeanie Carruthers as witnesses. Promoted to Lieutenant on January 2 1916, and later to Acting Captain, he was awarded the MC in 1918, and this appeared in the London Gazette on September 13. The citation read: “For conspicuous gallantry and devotion to duty. This officer, in command of a counter-attacking company of machine guns, brought them into action with great skill and inflicted enormous casualties on the enemy. His service and valour was recognised at home, and in November at the village’s Geilston Hall he was presented with a gold watch and chain, and a silver salver. He served in the 1918-20 British invasion of Russia and the 1920 defence of Odessa. A book about this stated: “The only men in the defence line were a Captain Macpherson and the men of the British Military mission's Kiev machine gun school which had been operating at Odessa, together with a small body of White Russians. On September 20 1920, the London Gazette reported that he had been awarded the DSO. The citation read: “For gallantry and devotion to duty during the fighting around Odessa at the end of January 1920. On December 6 that year, he joined ‘B’ Company of the Auxiliary Division of the Royal Irish Constabulary, a paramilitary unit of the Royal Irish Constabulary during the Irish War of Independence. It was set up in July 1920 and made up of former British Army officers. However two months later he was permitted to resign. He and Isabella set up home in Carlton Buildings, 24 Sinclair Street, Helensburgh, where three of their four children were born. But they decided to emigrate to Canada, and they landed there on June 11 1927. Nothing is known of their life tin Canada, and, now a Major, he ceased to belong to the Reserve of Officers because of age on January 25 1939. He died in Vancouver, British Columbia on January 4 1969, and is buried in the city’s Mountain View Cemetery. ■ This how the Helensburgh and Gareloch Times reported the 1918 Geilston Hall reception . . .
FOR the second Saturday evening in succession the community of Cardross met in the Geilston Hall to do honour to one of the many gallant lads who left the village at the call of King and country to take up arms in defence of liberty. Last Saturday evening the commodious hall was filled to overflowing, the occasion being the handing over of valuable gifts in the name of the Cardross people to Major Angus McPherson, DCM, MC, Scots Guards, 2nd Argyll and Sutherland Highlanders, 30th Battery Machine Gun Corps. The parish minister, the Rev William Maxwell, M.A., presided, and was accompanied on the platform by Major A.McPherson, Mrs Murray, Moore Park; Major John McFarlane, Captain J.Campbell McIntosh, Adjutant; and Lieutenants T.B.W.Niven and P.W.Macmillan, of the 1st V.B. A. & S.H; Lieutenant McGregor, 8th Royal Scots; Mr J.G.Chrystal, Bloomhil! ; the Rev A.M.Hunter, Mr A.McIntyre, Mr H.Inglis, Mr W.Chaundy, Mr R.Boyd, Mr McCutcheon, and Mr W.Brown, who acted as secretary and treasurer to the testimonial committee. Apologies for absence were announced from Lieutenant Colonel Gardner, Major Bums, Major Cockburn, Lieutenant Hendry, and Miss Geils, Edinburgh. The local section of the county Volunteers and members of the Boys Brigade were present in uniform. Angus McPherson joined the Scots Guards Regiment on July 1st, 1907, when only 16 years and 7 months old. He had only been three months a Reservist when war with Germany broke out, and he was called back to join his regiment, the Scots Guards, in August, 1914, and formed part of the first original Expeditionary Force, landing at Le Havre on 16th August, where he proceeded at once to Mons. His experience of the first action was at Mons on 21st August 1914, and he withstood the whole retreat to the Marne, subsequently advancing to the Aisne battle fought on the 14th September. The retreat from Mons will be recorded in history as the most heroic endurance of any part of the British Army, and we may well be proud of Angus McPherson who has been spared to us to come through safely. To engage in the first battle of Ypres, he was transferred there on 30th October 1914. The engagement at Ypres took place on 11th November against the Prussian Guards of the Kaiser, and the battle continued until the 16th November 1914. Resting until 23rd December 1914, he again was brought into action at the battle of La Bassee Canal on Christmas Day, 25th December 1914. On 25th January the Prussian Guards were sent out to engage our forces at Brickfield, La Bassee, then "No Man's Land”, with the intention of taking it to commemorate the Kaiser's birthday, 27th January. Angus McPherson took part in this engagement, and again for his soldierly conduct in battle was recommended for his commission, which was granted to him on the field on 4th February, 1915. Transferring his services to the 2nd Argyll and Sutherland Highlanders on 4th February 1915 he was sent to Armentieres, where our lines were being held against the enemy, when on 23rd September, 1915, he was again in the attacking force at the Loos battle, at La Bassee, and for the first time was severely wounded. Seven months elapsed before his complete recovery, when he was sent to Grantham, and remained there five months attached to the Staff, leaving again for France on the 6th January, 1917. He took part in the fierce actions of Vimy Ridge, 9th April, 1917; Builecourt, 25th April, 1917; Menin Road, Ypres, 31st July, 1917; Gullivelt, 25th September, 1917; and was held in the fighting line at Ypres until January, 1918, being then transferred to St. Quentin, where again our army held the line until 21st March. The engagement on 21st March, 1918, at St. Quentin, and our retreat, lasted until 28th March, terminating at Amiens, and during this engagement Angus McPherson’s bravery and courage was conspicuous, and he was recommended for the Military Cross. Fighting again at Passchendale Ridge on 15th April, 1918, caused our retirement to Pilcken Ridge, and subsequently to Dickie Bush Lake, where our lines were again held firmly until 18th September, 1918. Entering into action again on 20th September, fighting continued until 29th September at Villers Guislain, when, as you are all aware, it was necessary for Angus to retire, having been gassed. In recognition of the part he played, his Commanding Officer, Lieutenant Colonel G.S.Hutchison, writes: “I highly appreciate your gallantry in action at Villers Guislain on 20th to 29th September, 1918." Mrs Murray, in the course of a congratulatory speech, said the village of Cardross had done well. For the past four years they had been living in darkness and gloom, but on coming along to the hall that evening she was struck with the approaching dawn that they were all looking forward to by the bright roof lights from the hall. It was most pleasing to think that the spirit of fear and trembling about a blink of light escaping from their drawn blinds would soon be a thing of the past. Mrs Murray looked upon the occasion of presenting these handsome tokens as a great privilege. The presentation consisted of a gold watch and chain, silver salver (with an inscription), and a diamond pendant for Mrs McPherson. With each gift Mrs Murray made some pleasing reference. On the gallant Major rising to reply he was received with great enthusiasm, and accorded musical honours, concluding with three cheers for himself and one for Mrs McPherson. In the course of a modest reply, Major McPherson said a soldier lived to do his duty for King and country, and it was only in trying to do his duty that he had won the honours that he now held. 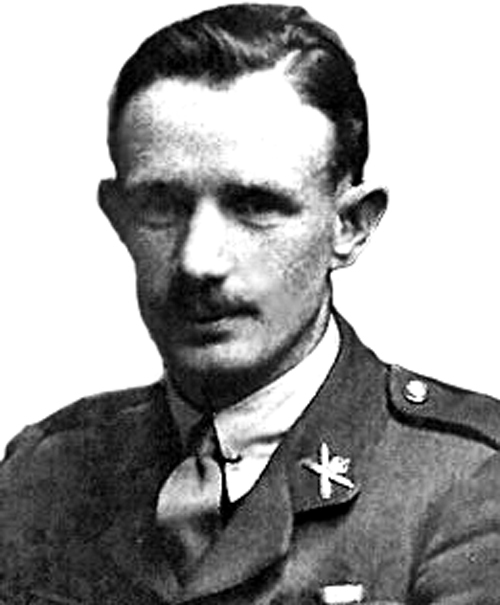 As a Mons hero, Major McPherson also wears the ribbon for the Mons star. During the evening an opportunity for inspecting the gifts was taken advantage of by a large number, who in turn congratulated the hero of the evening. The musical programme had a patriotic send-off by the singing of Rule Britannia, the audience joining in the chorus. The following artistes contributed most popular items: Miss Reynolds and Mr George Kincaid, Dumbarton; Misses Arroll and Holmes and Mr Joseph Hattle, Helensburgh; the Rev. A.M.Hunter and Quarter-Master-Sergeant A.Campbell, Cardross. The accompanist of the evening was Mrs Blackston, Cardross. The customary votes of thanks to Mrs Murray and the chairman were proposed by Mr Chaundy and Mr Inglis. The latter gentleman in the course of his remarks created great enthusiasm among the audience by announcing the abdication of the Kaiser and the Crown Prince. Before dispersing the National Anthem was sung, bringing to a close a memorable evening that will long be remembered by those present.